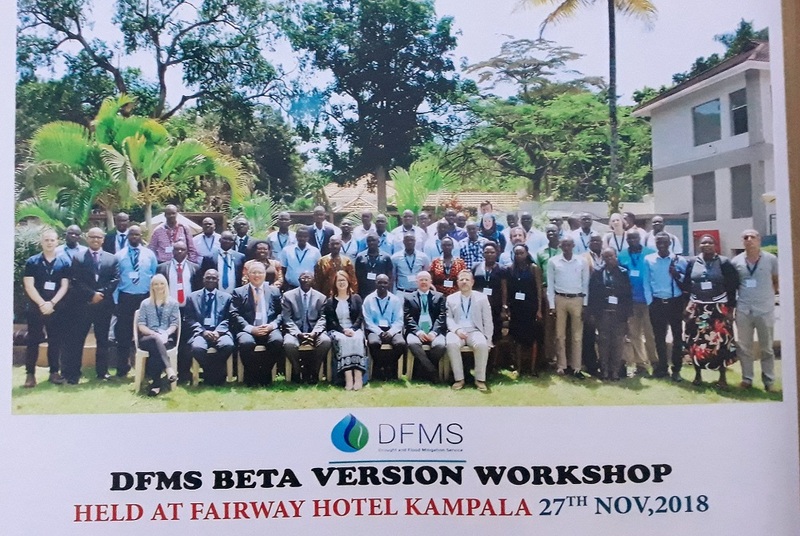 It’s an exciting week as I’m in sunny Kampala in Uganda helping demonstrate the Beta version of the Drought and Flood Mitigation Service (DFMS) we’re part of developing. We’ve already had a number of productive meetings and discussions, and yesterday was the large user engagement workshop. DFMS is the result of the DFMS project which is combining a range of meteorological, hydrological, Earth Observation (EO) data and in-country data to improve, amongst others, assessments of the current and future amount of water within the ground, how much will be used by plants and when the next replenishing rains will come. Together this should provide local decisions makers in the Government of Uganda, Uganda’s Agricultural Sector, and its Development Sector, with a forecast of whether they can expect sufficient, too much or too little water in the coming period and take actions to protect their crops and land accordingly from any potential future drought or floods. Image courtesy of DFMS project. 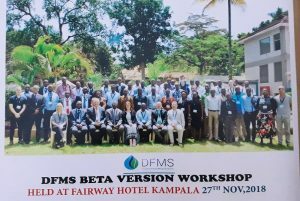 The DFMS Project, which is two years into its three-year length, is led by RHEA Group, and we’re part of the Consortium alongside the UK Met Office, HR Wallingford, Environment Systems – a fellow EO company, Databasix, AgriTechTalk and Mercy Corps. The work is being undertaken in cooperation with the Government of Uganda, led by the Ministry of Water and Environment. It’s part of the UK Space Agency International Partnership Programme (IPP) which is a 5 year £152 million programme which uses the UK Space sector’s research and innovation strengths to deliver a sustainable, economic and societal benefit to developing economies. The DFMS project features as a case study in the Space for Agriculture in Developing Countries report, which is one of three the UKSA has issued to demonstrate how the space industry can help to save lives and livelihoods from natural disasters and deliver better management of forests to improve production and protect nature on a global scale. Soil Moisture is the ‘wetness’ of the soil and tells us how much water it is holding. Land Surface Temperature is how hot the ground would feel at the surface at the hottest part of the day. Water Extent shows areas of land permanently or temporarily covered by water, alongside any areas of supersaturated ground. Water Height is the height of the water level relative to a specific point in time, and whilst it does not give exact heights over time it allows the increase, or decrease, of inland water bodies such as lakes, rivers and reservoirs to be monitored. NDVI which gives an indication of how much vegetation growth there is in the area, giving an indication of how healthy plants are. Burn Area Index showing areas that have recently been affected by burning. Historic land cover maps which help set the current information within a time and geographic context. Weather and Hydrological Forecasts giving two, seven and ninety-day forecasts, including temperature, precipitation rate, wind and runoff. Pixalytics is responsible for the first five of these products, with Environment Systems, HR Wallingford and the UK Met Office responsible for the others. In addition, the DFMS system will also showcase information on crop and livestock conditions using the Pictorial Evaluation Tool methodology from AA International. Combined, all of this data will provide a range of useful information, indices and indicators such as the health of vegetation, how quickly ground will dry out, areas at risk of flash flooding and the how much water is being absorbed by plants. Together this data will provide a comprehensive view of the land, vegetation and water availability in the local area which will give everyone affected the best opportunity to prepare for the coming conditions and taking whatever action is required. The DFMS beta version that is being made available to stakeholders this week is aimed at getting user feedback and comments on the data, the visualisation, and the usability of the system. This will be used to finalise development over the coming months with the operational versions of DFMS scheduled to be available by the end of May 2019. I’m really looking forward to further interesting meetings during the rest of the week – although, I’m not overly looking forward to returning to the cold temperatures of the UK! The project, and the other IPP work, are excellent demonstrators of the potential benefits or space-enabled and EO data can offer – particularly when combined with other in-situ data and local knowledge. This entry was posted in Agriculture, Copernicus, Data, Earth Observation, ESA, Landsat, MODIS, NASA, Remote Sensing, Space Can Help, Space Industry, Uganda IPP, UK Space Industry and tagged agriculture, AgriTechTalk, Burned Area, crop and livestock conditions, Databasix, DFMS, Drought and Flood Mitigation Service, droughts, Earth Observation, Environment Systems, farmers, flash floods, floods, HR Wallingford, hydrological models, International Partnership Programme, Kampala, land cover, Land Surface Temperature, Mercy Corps, NDVI, Pictorial Evaluation Tool, pixalytics, plants, RHEA Group, satellite, soil moisture, Space, Uganda, Uganda Ministry of Water and Environment, UK Met Office, UK Space Agency, vegetation, water extent, Water Height, Weather forecasts, yield by Sam. Bookmark the permalink.